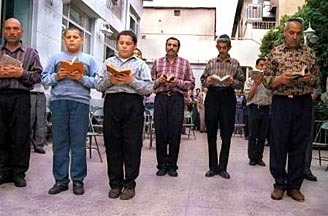 A Jewish School in Shiraz, Iran. Please read below to learn about the strong and proud Iranian Jewish community. (photo courtesy of http://www.iranian.com). you like to share with others. On to our Window number 28! ignored by the American administration and the opportunity that Mr.
songs different from the one proposed by Senator MacCain. last summer, the popular media allowed incredibly slanted reporting. * While we are on fun themes, Americans who lived in Iran in the 60s and 70s think about Iran nostalgically. Joy Martin, a subscriber to these windows, has sent me this beautiful photo-essay of the city of Abadan by Paul Scheroeder. Thank you Joy! Iranian Jews in a synagogue in Tehran (photo courtesy of AP, Hasan Sarbakhshian). A beautiful painting by Iranian artist Sholeh Reshad (click on the link below for more of her work). in harems. Click here: Sholeh Reshad Art. Enjoy. Till Window 29, have a great week! The Alborz Mountains of northern Iran, with Mt. Damavand (the tallest mountain in Iran) rising in the distance (see below for many more incredible photos of Iran's natural beauty). Yes, we missed a window altogether! The semester is coming to an end with lots of activity including course preparations, visits by the last speakers of the academic year, departmental duties, etc. My friend Alice Bloch and I had a repeat performance of “The Watching Heart: A Journey in Peace,” our Dance/Reading for Peace, last Friday on Washington University campus. A wonderful audience gave us a great response. A few of you approached me with e-mail addresses of friends to be added to this list. Anywhere I go now, someone has a kind word about the Windows on Iran. I cannot thank you enough for your enthusiastic support. If you handed me a friend’s address after our performance but they did not yet receive this window, I apologize. The safest way is to reply to this message and give me the addresses you want to add. Let’s get to the first item on Window 26 without further delay. I am working on reducing visual attachments with links so as not to make it hard for your home computers. Grammy-nominated Iranian musician Hussain Alizadeh. Noushin Ahmadi Khorasani, winner of the "Best Research Book on Women" in Iran award, is an activist, journalist, and translator. She is an editor of the journals Jens-i Dovom and Fasl-i Zanan and helped establish both the Women's Cultural Center and the Feminist Tribune. * Despite pressure from the Iranian government, the feminist movement in Iran is alive and well. So are its chroniclers inside and outside Iran. My friend Nayereh Tohidi has just sent word on this year’s winner of “the Best Research Book on Women” in Iran. Thank you Nayereh Jan! The prize has gone to the Persian translation by Noushin Ahmadi Khorasani – herself a noted feminist – of the book The Women’s Rights Movement in Iran: Mutiny, Appeasement, and Repression by Eliz Sanasarian Professor of Political Science, USC College. Congratulations to the author, translator, and the tireless Iranian feminists working in Iran! I have an additional reason to be delighted. Years ago Eliz and I were highschool friends in Shiraz. familiar with the region and have impressive academic credentials. A beautiful garden in Esfahan (Isfahan) (click on the youtube video above to see many more breath-taking photos from Iran, from the Persian Gulf to the Alborz Mountains). The Cyrus Cylinder (539BCE)--the world's first declaration of human rights, which among other things allowed for religious freedom in the territories that he conquered. of the current Iranian government? A Painting by Nargis Chalak (click on the link below for more of her work). * I said there will be fewer attachments. But we can’t close this window without the time honored tradition of visiting a young Iranian painter. Click here for some beautiful works by Nargis Chalak: Nargis Chalak Art Show. I wish you all a very nice week.